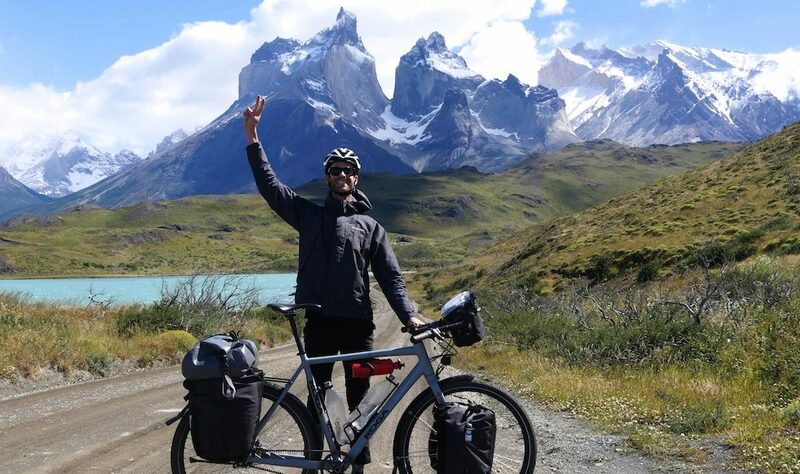 Bicycle touring in Torres del Paine National Park, Chile. I’m from Melbourne in Australia. 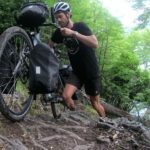 I’m currently cycling from Argentina to Alaska. 1.5 years. I plan on arriving in Alaska by July 2019. 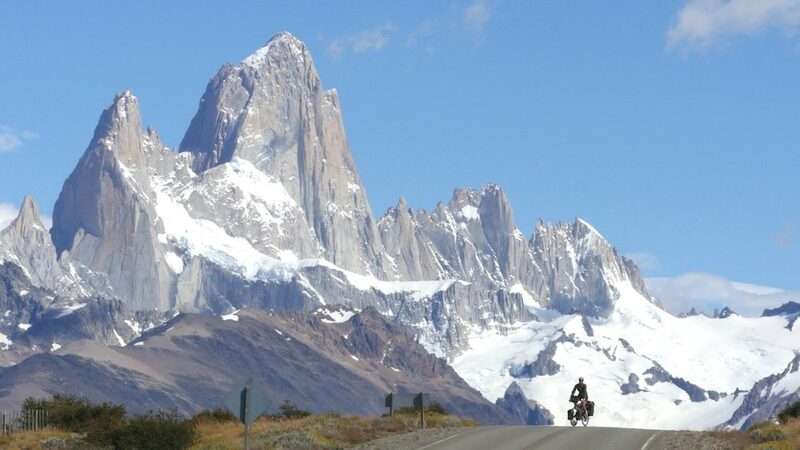 Cycling past Mt Fitz Roy, Argentina. I’m an incredibly curious person. I’m fascinated by everything from nature to culture and history. By travelling slowly through lots of countries I get to learn lots of new things every single day. I also think it’s really important to invest time into people and experiences so that you can (hopefully) be the richest and most-rounded person possible. 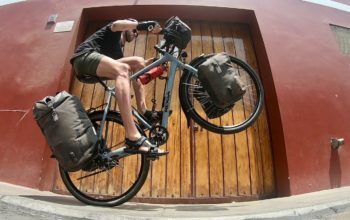 Why Do You Travel On A Bike? 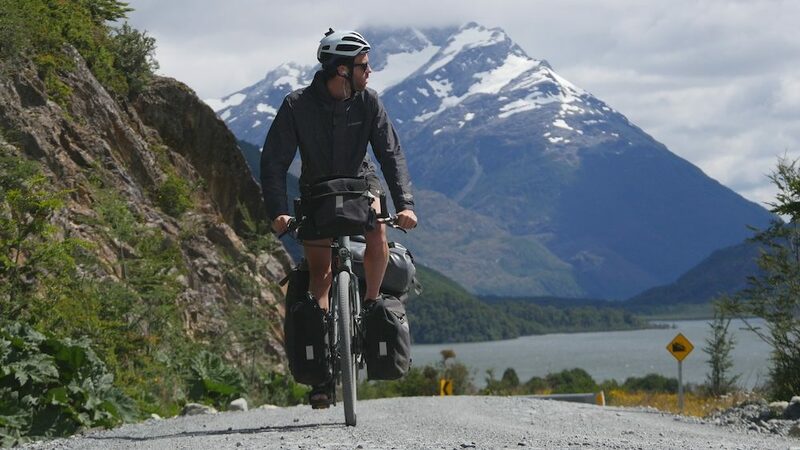 But I think my favourite thing about bike travel is that I’m instantly approachable – I’ve been afforded some incredible opportunities with locals because of this. 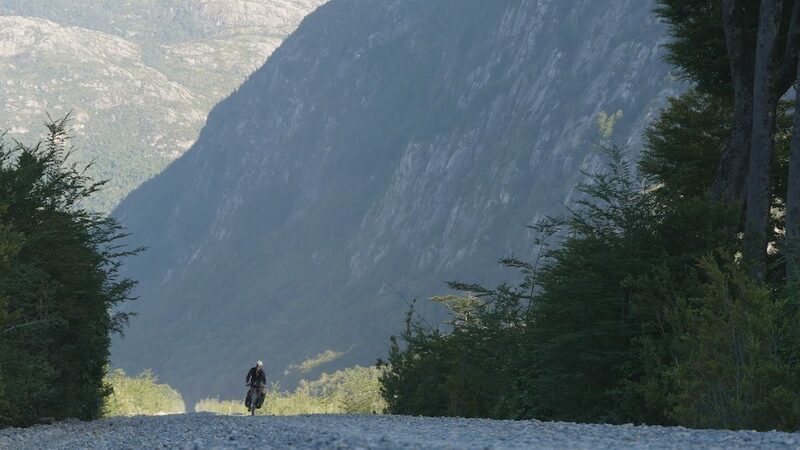 Bike touring on the Carretera Austral Highway, Chile. People often forget there’s a difference between ‘being alone’ and ‘being lonely’. I’m happy floating in my own thoughts, breathing fresh air, writing, taking photos, reading books and listening to podcasts. I have conversations with new people every single day, many of whom I will see again. I wouldn’t want to be in this state forever, but for now, it feels like such a luxury. 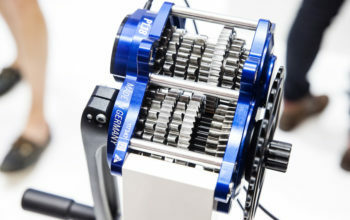 This depends on the weather, wind, road surface and terrain. A typical day for me is about 120km, but I’ve been riding well over 200km when I’ve felt the need. Sometimes my days are as short as 50km in picturesque locations with ample camping spots. I’m tired after a few big days cycling. But luckily a long trip affords me time to rest. After a few days of healthy food, good sleep and walking around – I feel fully reset and ready to do it all again! I’ve been cycling almost as long as I’ve been alive, so while my bum sometimes takes a bit of a hit on bumpy roads, it’s pretty well used to it. I spent a lot of time finding a seat with the right shape and use padded cycling shorts when I ride. It’s my experience that the world is overwhelmingly safe. People often provide warnings about many of the far-flung places I end up, but I’ve found that 99 times out of 100 these are unfounded hearsay – it’s best to keep an open mind. You’ll find that one-in-a-thousand people actually have bad intentions and that the chance of rubbing shoulders with them is slim at best. That said, it’s still important to keep an eye on political situations and speak to locals/police where you can. There are small pockets all over the world that have more crime and conflict than others, and it’s always better to avoid them. I mostly sleep in my tent. It’s my space to relax and unwind. 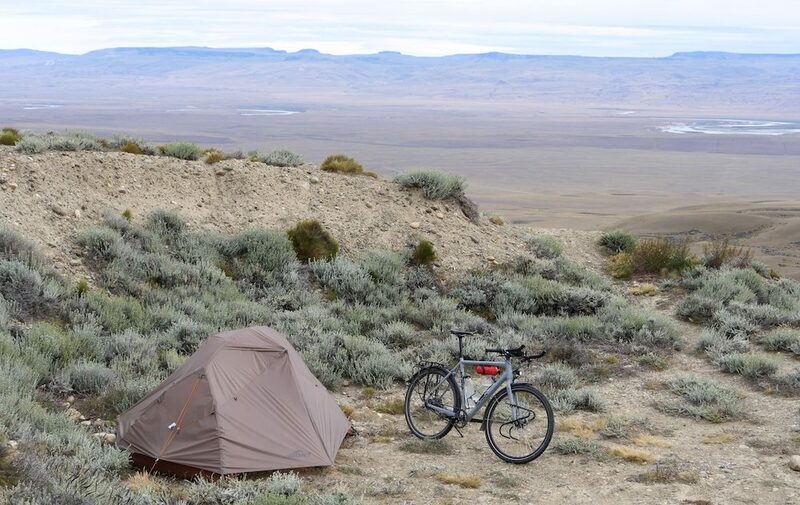 It’s comfortable and dry and it can be pitched almost anywhere I go. When I get to tropical areas, I will often stay inside hotels, hostels or with locals to get a better night sleep. Camping in the Puna, Argentina. I’m a little bit unique with what I eat because I don’t consume animal products (vegan). I spend a bit more time cooking my own food, and a bit less in restaurants. My staples currently include lots of oats, dried fruit, bananas, beans, lentils, nuts, seeds, vegetables, pasta, sweet biscuits, bread and jam. The short answer is that I love all animals, and it’s unfortunately not possible to be an animal lover while killing them for food or exploiting them for their milk/cheese/eggs/skin/fur/feathers. 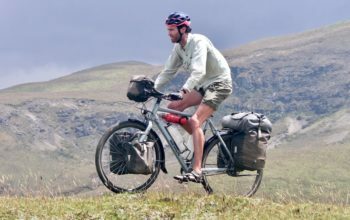 I’m living proof that you can be both an incredibly strong and healthy cyclist in any country in the world, without supporting the exploitation of animals. If you probe me further you’ll also find I’m trying to reduce my impact on the world as much as possible. Animal agriculture contributes to more than 20% of global greenhouse gas emissions, it consumes 20-30% of fresh water, and it’s the leading cause of habitat destruction, species extinction and a loss of biodiversity. I’ve also been studying up on diet and nutrition and have found ample peer-reviewed research that suggests that cutting animal products as much as possible leads to better health outcomes. 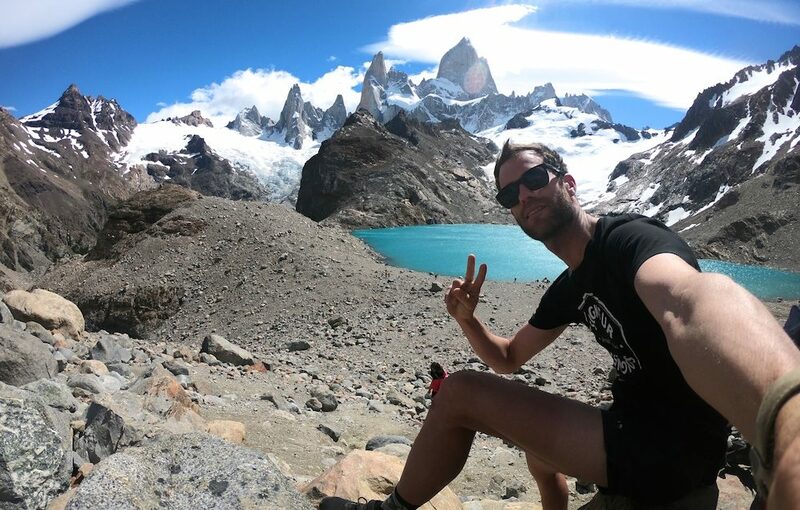 Hiking in Los Glaciares National Park, Argentina. In terms of food, I miss Bonsoy-branded soymilk, Melbourne-grade coffee and Indian-flavoured curries. How Do You Carry Gear For All Weather Conditions? I’m only carrying what I need for six months at a time. As I travel further north, I plan on swapping to more summer-appropriate gear. This includes changing my tent inner and much of my clothing. 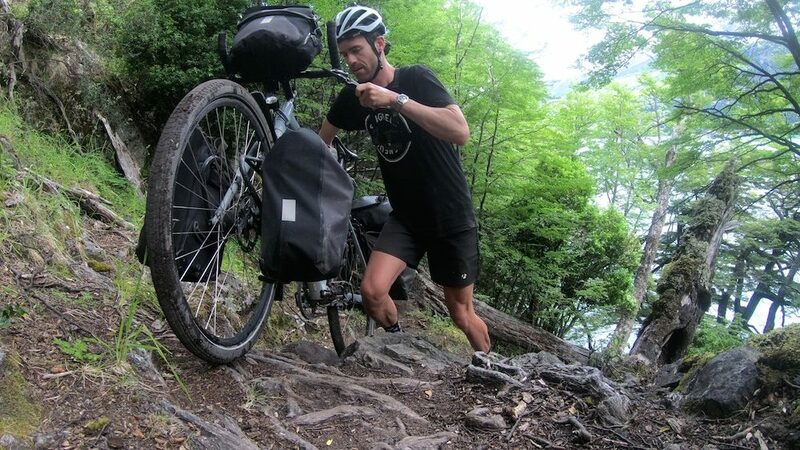 Carrying my heavy bike along a hiking trail around Lake Desierto, Argentina. 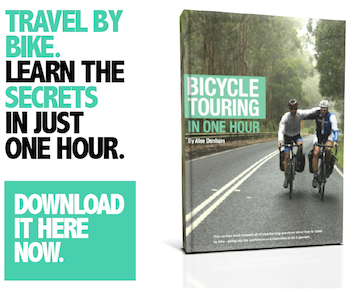 Travelling by bike is as cheap or expensive as you like. In many places there’s no need to pay for transportation and accommodation either ­– your living costs are essentially just food. 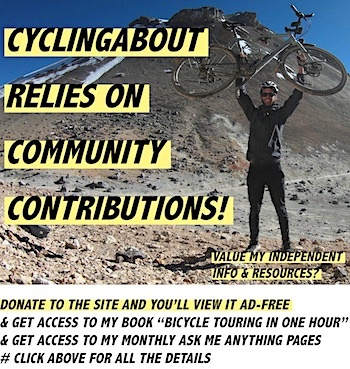 I’ve met lots of cyclists spending just US $5 per day. I tend to spend whatever I need to have the experience I’m seeking. I also don’t cut too many corners when it comes to nutrition. 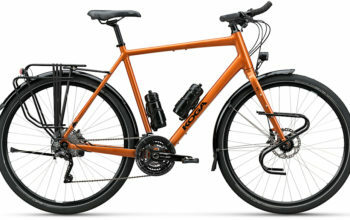 With every cost involved (including things like insurance, replacement gear and bike parts) I’ll likely spend US $1000 per month averaged out over my whole trip. Without a doubt, the best part is the people. The people I stay with, the people who invite me into their homes, the people who I form close friendships with and the endless people who wave, smile and shout ‘hello!’ to me every day. I don’t really enjoy cycling in strong winds or on corrugated roads. I also prefer it if cars give me lots of space when they pass! 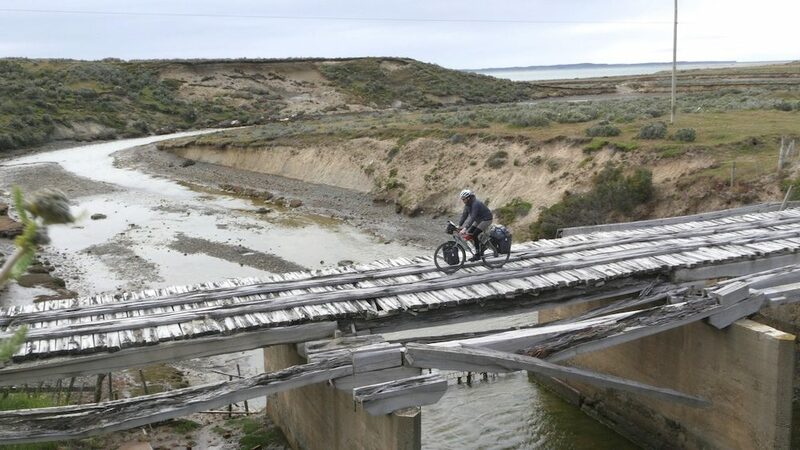 Crossing an old bridge, Southern Patagonia. 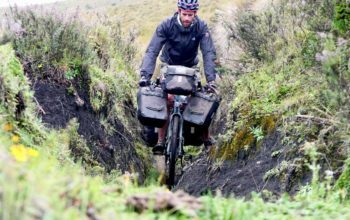 My bike is about 15kg, my gear is about 25kg and then you can add food and water on top of that. It’s a lot, but I use everything! I typically haul three litres at a time. This is expected to expand to over 10-litres in desert areas. 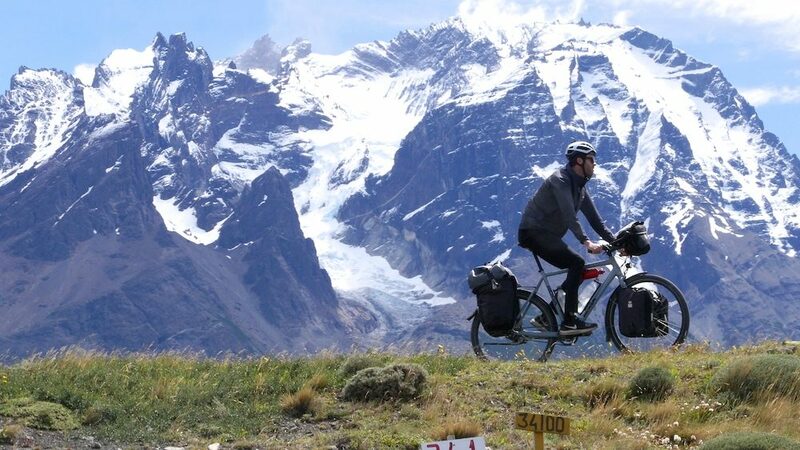 Riding near Caleta Tortel, Chile. I would like to get a working holiday visa for Canada. There are so many places that I want to visit in North America, and it’s not possible to see all of them on this trip. I’d love to share a meal or drink with you! If I’m able to stay with you at your house, this is always appreciated too because I love learning about places with the guidance of a local.